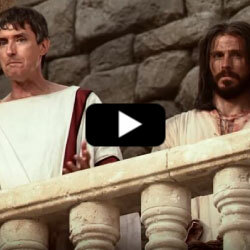 In this video about Jesus, you will see Jesus before Pilate who was the Roman governor of the region. Since the Jews were under Roman rule, they could not condemn anyone to death and crucify them without receiving the approval from the Roman governor over them. Hence, the Jews took Jesus to Pilate to be judged. Pilate had heard the Jews call Jesus the king of the Jews. So, he asked Jesus if He was the king of the Jews. His intentions may have been possibly to confirm or dispel the myth that Jesus was seeking for power over Pilate and the Romans. Jesus told Pilate that His kingdom was not of this world (John 18:36). His answer satisfied Pilate. After realizing that Jesus was no threat to his earthly power, Pilate tried to ascertain what Jesus had done that would have Him condemned to death by the Jews. After questioning Jesus, Pilate went before the Jews and said, “I find in him no fault at all” (John 18:38). It was customary among the Jews for there to be a prisoner released around the Passover time. So, as Pilate went before the people, he asked them if they should release Jesus, so that He may go free. The crowd who had congregated, consisting mainly of Pharisees, Sadducees and the elders of the Jews, as well as common people who were for the most part against Jesus. The crowd cried for the release of Barabbas who was a notable prisoner (due to the persuasiveness of the chief priests elders among the Jews - Matthew 27:20) and wanted the crucifixion of Jesus. Pilate then had a picture of water brought before him for the people to see. He then washed his hands in front of the people as a sign unto them and said, “I am innocent of the blood of this just person: see ye to it” referring to the crucifixion of Jesus (Matthew 27:24).